Looking for a gluten-free treat to serve this holiday season? Look no further! These Gluten-Free Sugar Cookies are soft, sweet, easy to make, and everything you want in a holiday cookie. I’m often asked if I can share recipes on ABK that are gluten free, because not everyone can enjoy treats made with flour because of gluten intolerance. If you know me, you know I won’t share anything I haven’t made myself. All of the recipes here are tested and heartily approved before publishing. What if I told you there was a gluten-free cookie that tasted just as good as the original? 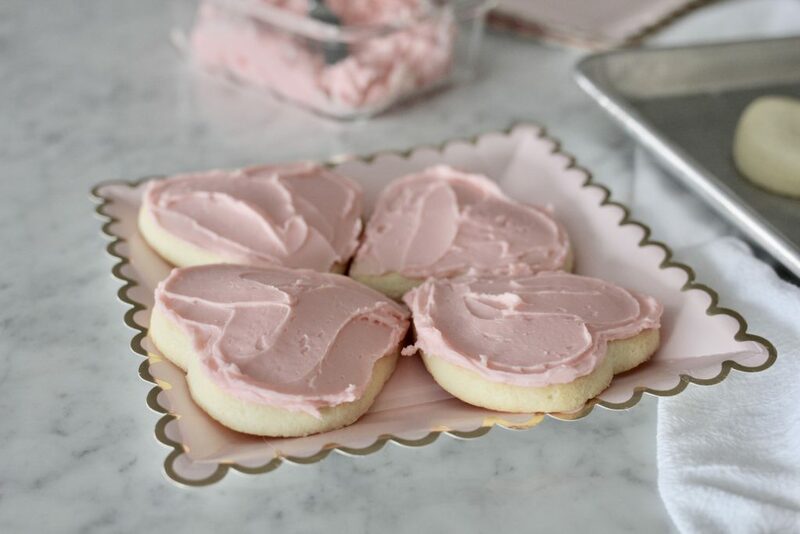 Gluten-Free Sugar Cookies are a little crispy on the outside, soft and light on the inside, and taste absolutely delicious. 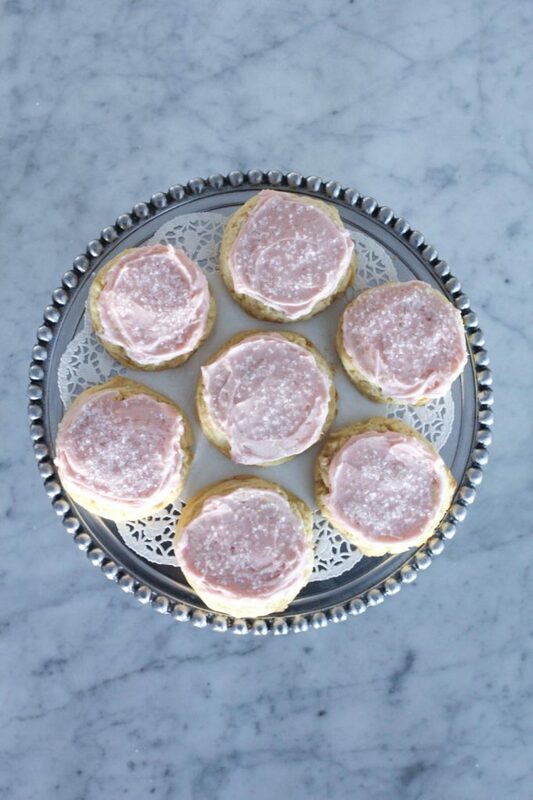 My friend Nancy, who has celiac, bakes sugar cookies every year for family and friends at holiday time and told me she had experimented with gluten free flour to make her traditional cookies and loved the result. 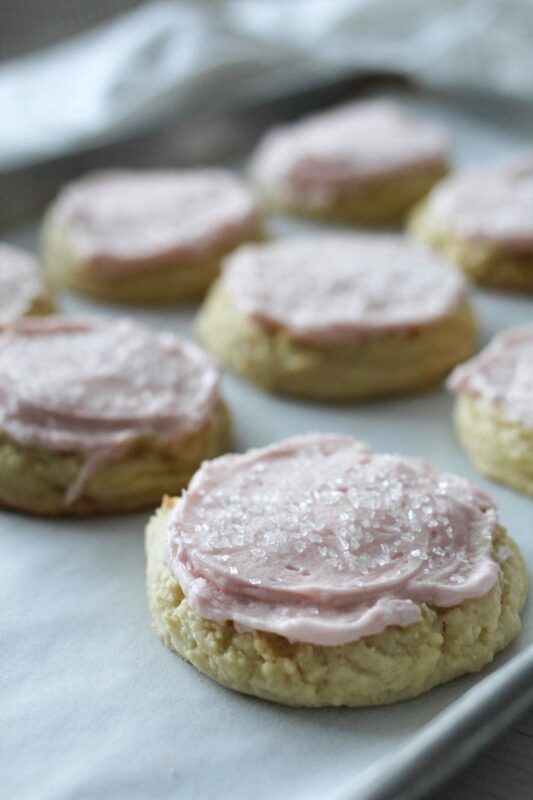 When we needed some gluten free cookies for a church activity recently, Nancy offered to make a batch of her gf sugar cookies… I was blown away the result! So good. I had to get the recipe to share with you. I’m not usually a fan of gluten free treats, but this cookie rivals any traditional sugar cookie baked with all purpose flour! Christmas cookies are an essential part of the holiday season. 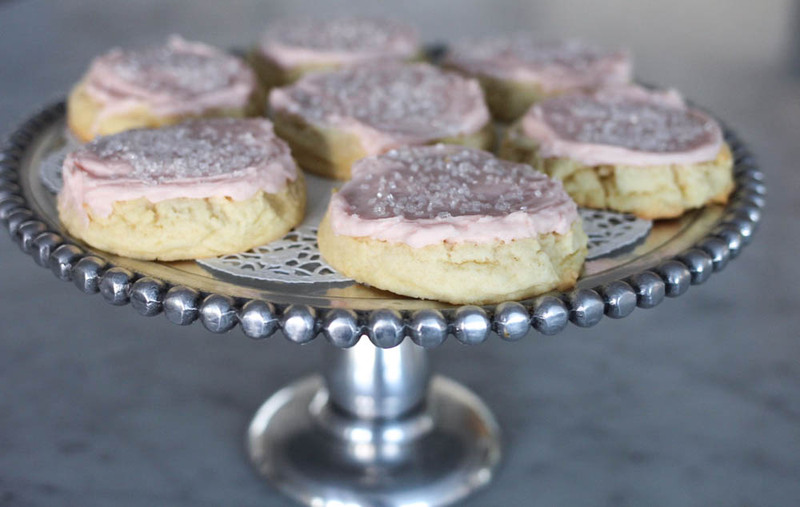 And with Gluten-Free Sugar Cookies, there’s an option for everyone on the cookie tray. Plus, NO ONE will know they’re gluten-free. The flavor, texture, and appearance will have everyone coming back for seconds. They may just become a new holiday favorite for your family and guests. 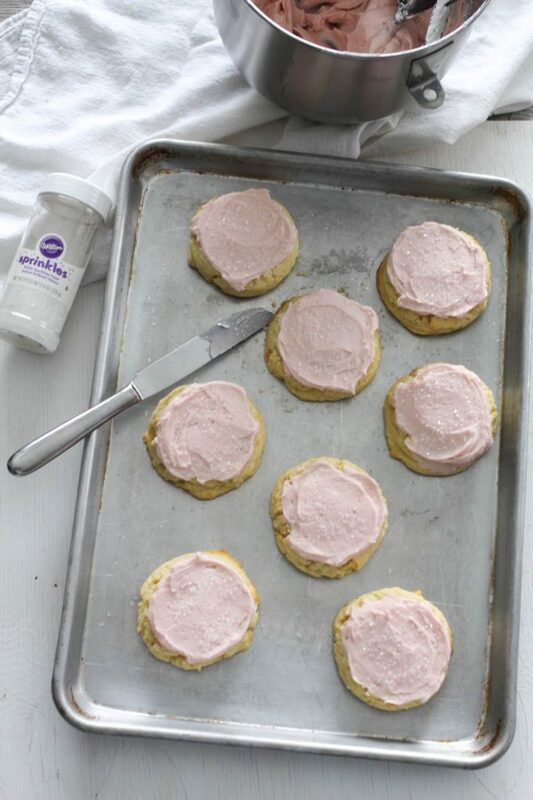 Gluten-Free Sugar Cookies are the perfect addition to your Christmas cookie list. 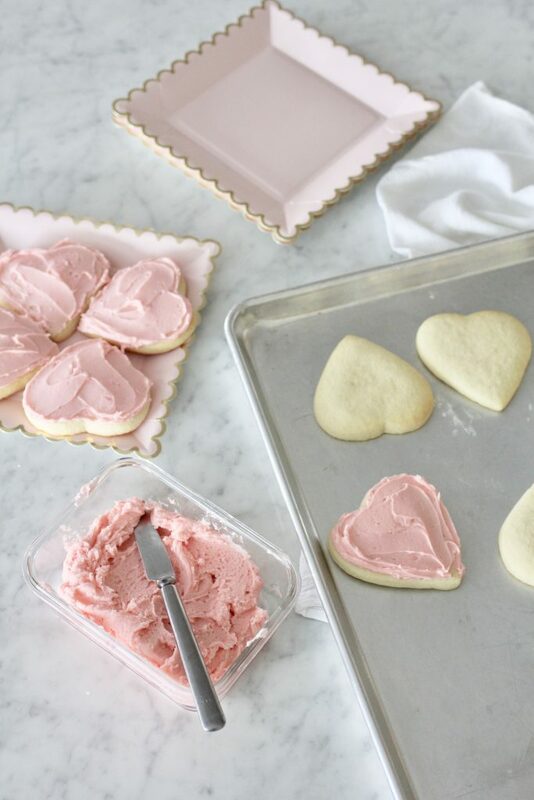 Roll out the dough to cut into shapes, or scoop it, like I did into a Swig-Style cookie! The key ( according to my friends who are expert gluten free bakers) is to make sure to refrigerate the dough for a full 24 hours. It makes a huge difference in the final product. This allows the GF flour to absorb the liquids in the dough and makes for a cookie that is less likely to fall apart after baking. I also believe the refrigeration allows the flour to soak up the liquid and creates a less gritty finished product. I used Cup 4 Cup Gluten Free Flour on Nancy’s recommendation, which may be purchased online or in most grocery or big box stores! 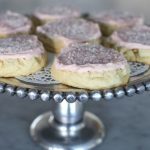 If you’re looking for a really amazing sugar cookie you need to try these Gluten-Free Sugar Cookies. 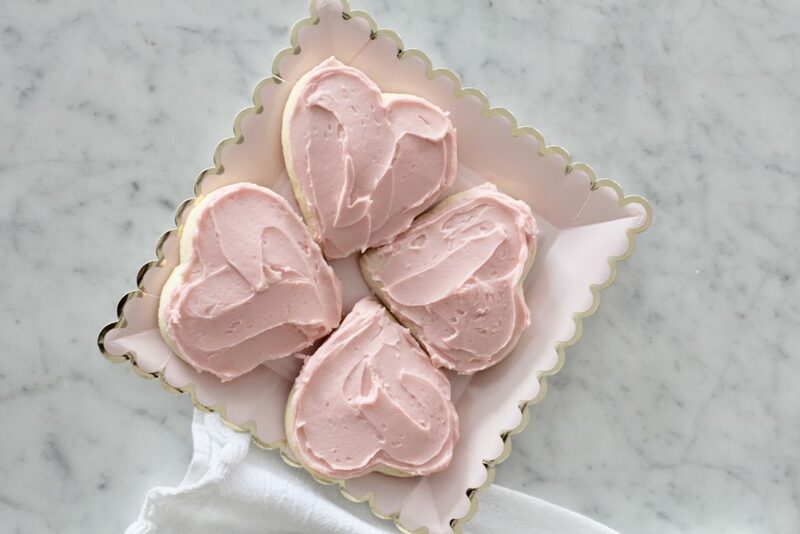 They’re light fluffy like a sugar cookie should be, and each bite has that irresistible sugar cookie flavor. 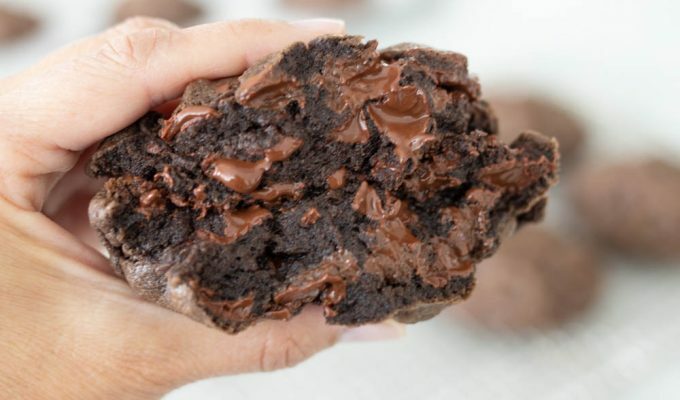 Also, try out some other gluten-free recipes on ABK … Gluten Free Chocolate Quick Bread and The Best Chocolate Chip Oatmeal Cookie. ​Looking for a gluten-free treat to serve this holiday season? Look no further! These Gluten-Free Sugar Cookies are soft, sweet, and everything you could want in a holiday cookie. Cream together butter, eggs, and sugar until smooth. Mix in remainder of ingredients. Be careful not to over-mix. Use low speed on mixer and scrape down sides at least twice. Cover tightly with saran wrap and place in refrigerator for 24 hours. When ready to roll or scoop out dough, remove and let dough sit on counter for 1 hour. Then proceed with directions. 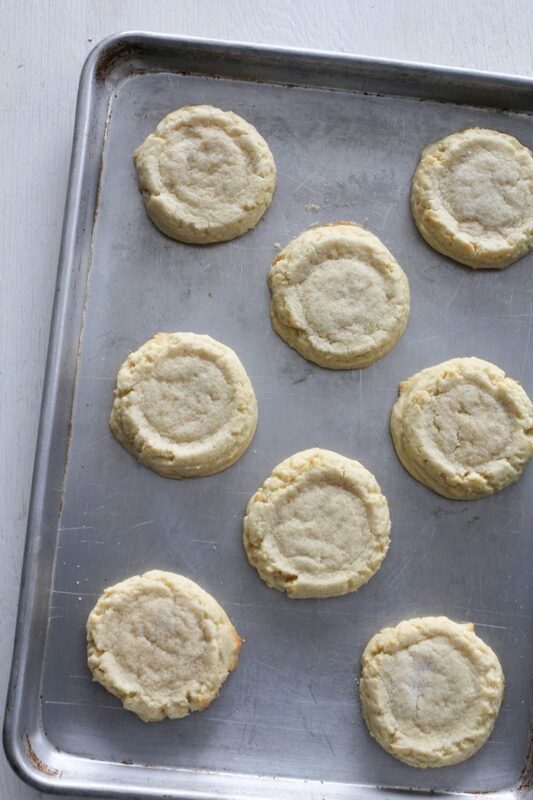 Use a #16 cookie scoop, place baking sheet. Using a small glass,dip the bottom of glass into sugar in bowl. Press and twist the glass until the cookie ball is about 1/2 inch thick. Repeat until all dough is scooped and lightly pressed. Place on ungreased baking sheets about two inches apart. Bake at 400 degrees or 375 convection for 6 to 8 minutes, or until lightly golden brown on the edges. Place soft butter in a large bowl or bowl of a stand mixer. Using media high speed, mix until smooth. Turn mixer off. Add powdered sugar. Mix on low. Scrape down sides. Add salt, vanilla or almond extract and 2 tablespoons of milk or cream. Mix on low if needed, add more milk or cream. Beat until smooth about 1 minute. Frost cookies when completely cooled. 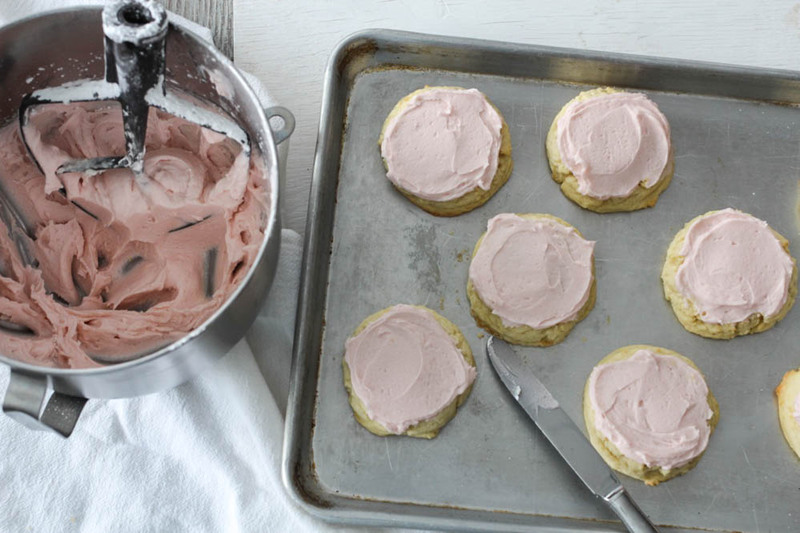 If using sprinkles, add immediately after frosting cookies. *you may use all lemon or all vanilla or almond flavoring. I use all vanilla. The sprinkles are purchased at any cake decorating supply store or online at Amazon. This recipe may also be made with All Purpose flour. I’m excited to try these! Have you ever tried scooping them into balls and then refrigerating them? Do you think that would have the same positive effect on the texture? Thanks! Hi Lindsi, you could definitely try refrigerating them. It should still have a nice texture. Thanks for asking! Which GF flour did you use? I used Cup4Cup in this recipe. i have also used King Arthur GF flour with great results. Thank you for the recipe! My daughter and I both have Celiac, and sugar cookies are a favorite! Can’t wait to try these! I hope you love these Laura! I think they are the best GF cookies I have eaten! I already made these and they were delicious! I used almond extract and cup4cup. Thanks so much for the recipe! You’re welcome, Paris. These cookies are so yummy, I’m glad you enjoyed them and thanks for your comment! I see it in the grocery at most stores. Harmon’s, Smith’s, online at Amazon, and also at Target. Hope this helps! This recipe is perfection. It rolls-out and bakes-up just like a glutenful recipe. I haven’t made sugar cookies for a very long time because I couldn’t find a recipe that worked, so I was really excited to try this one. I used Namaste flour because that’s what I had on hand and it turned out well. Thanks Nancy and Si! It’s such a wonderful gluten free recipe. I’m glad you enjoyed it, Bonnie and thanks for your comment! I just put the dough to these cookies in the refrigerator!! I am hoping she loves them!! Thanks for everything!! I served these to a GF friend at a Christmas party. She LOVED them and begged for the recipe. Everyone else ate them and said they were delicious. They thought they were from a local bakery and couldn’t believe they were GF. That’s what I love about this recipe too, Laura. It tricks everyone into thinking it’s not a GF cookie because it’s so good. I’m so glad you enjoyed this recipe and thanks for sharing! Do you have to keep the dough in the fridge for exactly 24 hours? With my schedule right now, I can either make the dough and leave them in the fridge for about 15 hours-ish, or it would have to be in the fridge for about 36 hours.. ? And after baking how long will they stay good for if placed in tupper-wear? Hi Cristina, for the best results, I would refrigerate the dough for 24 hours or more. You could still make the cookies after refrigerating for 15 hours, but make sure to keep an eye on them while baking. And the cookies should stay fresh in tupper-ware for 3-5 days. Hope this helps and thanks for asking!